Turned by hand and using both solid and veneered timber, the Nicole Occasional table has a simple but graphically striking Silhouette punctuated by the metal collar. The Nicole occasional table is shown here in natural oiled walnut and brass, and also in ebonized walnut with bronzed brass. Each Stuart Scott piece is built by hand in our workshop in Wiltshire, England. Nothing is mass-produced. This ensures complete attention to detail, structural integrity and sheer build quality. We never compromise. When we finish each piece, it is signed and numbered: a unique handmade masterpiece. Registered Design No. 6010512. Customers can choose from the following timber finishes: Oak - Oiled, Aged, Ebonised or Ebony / White *Limed. Walnut - Oiled, Ebonised, Black Lacquered or Ebony *Limed. *Liming carries an up-charge of £120.00 per table. Customers may also choose from the following metal finishes: Natural Copper, **Polished Nickel, Natural Brass, or **Bronzed Brass. 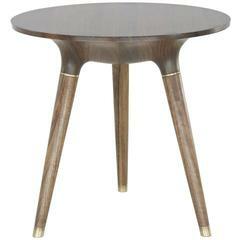 **Bronzed Brass and Polished Nickel carry an up-charge of £60.00 per table. Two-tiered mid-century walnut coffee or end table with rattan shelf. 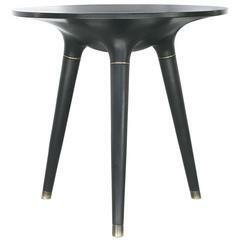 This oval occasional table was designed and produced in Austria-Hungary, circa 1915. It was made of oakwood. 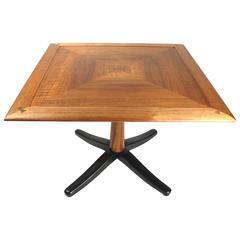 The table is completely refurbished and varnished to a high gloss. 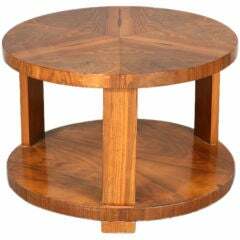 Art Deco occasional table with walnut veneered top and lower shelf.